THE 18-year-old student was last seen on CCTV crossing Henderson Street in Bridge of Allan on Friday, January 18 2013 The last sighting of the 18-year-old was captured on CCTV and it shows him crossing Henderson Street in Bridge of Allan at 2.19am on Friday January 18. The footage shows him walking along the road towards the Keir roundabout. Police are keen to hear from anybody who may have been in the Bridge of Allan area around the time. Anyone with information can contact police on 01786 456000 or details can be given anonymously to Crimestoppers on 0800 555 111. I have been asked various times if I would look at the Tarot for David 0'Halloran as a matter of urgency. I have agreed that I would do this. Tarot as you know, gives glimpses of POSSIBILITIES past present and future, it does NOT promise FACT. Fact can only be determined if future news reports can validate what Tarot may have seen. Please remember this whilst reading and also please take time to read the notes regarding Tarot that are provided. The first card that I have received for David in respect of the date that he has disappeared is the 9 of swords. The first thing would be to note that the 9 may represent a distance or indeed a route number/road. Noting that it is reversed we may have the number 6 here also. This card can show someone at night with some feeling of illness, sometimes mental illness can show up here or problems to do with their head, whether headache confusion, some kind of disturbed imagination or something else. A person could have a head injury in this card too or have fallen. Could lead to problems with a BACK. We have note that a church would appear in these cards or possibly churchyard and possibly drugs or some impairment of mind for someone. I see that there may have been some kind of altercation with somebody else at some point, perhaps there were three people and one split away from the others. I am seeing a church and two people looking over the water edge. The colour Black and Silver and also the word Jewel or even Jewelry might come up. There may be a riverbank but it seems the Police are already searching the water on the above report. Railways, airports and golf courses can show up in this card and represent places in the vicinity. The initial direction of this card is thought to be East but West also comes up here and will show descriptions that could be either side. The Colour Yellow is seen. The word Hazel. There seems to be some sense of fear or anxiety or some concern about someone here. We also get grandparents, bedroom scenes and computing/computers within this section of swords. The word Hart or Heart may come up and a circle? . Swords are cutting instruments therefore they can be actual elements of some kind of separation or cutting of ties or cutting itself. Im feeling as though ' I cant see'. Other places/landscape or attempts at naming a road or place are the following Keywords - Hills and mountains, high places, barns and storehouses corn /grain. Libraries and studies, the walls of houses, the hall, playrooms, chests, drawers, wallets, purses, money places (PROBABLY means 'Stirling' ie - sterling ) or Bank. Seeing somewhere up high or the fact that a place would sound high in its name. Also could represent a bedroom or a BED as in riverbed. Water Rocks Stone Cement, word cannon or canyon or forge - weapon or weapon names. Person description may be straight thin, high forehead narrow long face, long nose; black or grey eyes or between , thin lips and nose, no beard, possibly stubble , plenty hair brown colour/black. Complexion Olive or Chestnut. Possibly jokey or shifty. Possibly a foreign man? Surgery? Doctors or Police matters. Generally this card is South and when I ask where David might be this card can suggest injured as you can see there is a bandage on the head of the person in the card. It can show defending oneself but the card can represent an Attic once again with the number here being 9 so we are looking at a route or road here. There may be a bridge over a river or the word Bridge to the West or somewhere around here and there is the word Castle. This card shows that we might have taken a lift or hitchhiked and had a decision to make at the same time. It seems to show being near water perhaps also at one point between buildings? This is a firecard so words that include Burn or Fire may come up here. The word Ash may come up also. Industrial areas may be somewhere in the vicinity as may walls or some connection to the word Sand unless it is dusty sandy roads. Its possible there is a house on a hill or that the word Hill comes up here and a stream/river - field? also an airport in the vicinity? OR arrows? Some kind of grey tarmac? perhaps some sporting elements here, sports field, or someone sporty? Someone who may seem like a friend, very affable, friendly person travels a lot in vehicle goes from location to location. Seeing a place of entertainment, dancing? construction/ construction worker or construction site? Possible people who may have tried to attack him? seeing him standing his own ground? Looking about him? May be getting a link to the word Military. Keywords, person description or may be keywords in respect of places are Someone who is well proportioned, tall and large. Complexion ruddy dark or tanned. Light chestnut hair, strong sporty and able. All I seem to be getting here is a change of residence or a circle regarding when David will be found. The number 30 or 3 or 21 appears here which could represent time elements or indeed it Could be roads and routes. I do have sporty elements and possible physical concerns here as of course this sits next to the judgement card. It may be the numbers that are given to us form a matter of days or that they form a period of time or even a month. I would have thought before the Spring. However, I cannot guarantee this except the good news is that he will be found. The world revolves clockwise and therefore dips to the south and comes up again so I wonder if we are looking south here. It might be possible. He will be found though but I cannot promise that I have named a location. Directions given could involve other people and for that reason we do have to bear in mind that wherever they are connected could show up in this Tarot. This card can represent travel therefore connections to vehicles can show up here. Please remember that Tarot represents the past present and the future and POSSIBILITIES and not FACT. Fact is not fact unless something arrives in the media to validate anything seen here. Please read all the tarot in combination to each other. I hope something is helpful. DAVID O'HALLORAN'S dad fought back tears this afternoon at an emotional appeal for information on his son's disappearance. A fresh appeal is made for information on missing teenager David O'Halloran, who has not been seen since a night out in Stirling. THOUGHTS ABOUT POSSIBLE LOCATION VICINITY. Note from Empathy: Have they searched Mine Wood or Black Shed Wood? There is an industrial estate at Springkerse and Back 0' Hill Road. On the Map there is a route 9 Causewayhead over the river from Customs Roundabout. There is a Bridge there and the Stirling Rugby Club. (thinking out loud). The Attic area has been mentioned already in Tarot whether that is significant or not I cannot be sure. Golf courses and Railways CAN appear in this Tarot as vicinity or landscape. I will pop back in and try to see if I can update in anyway. THESE ARE KNOWN MOVEMENTS OF DAVID. NOTE FROM EMPATHY 18TH FEBRUARY 2013. I think David is connected somehow to CORNTON ROAD because this is described in one of our Tarot cards. I am still working on this map and route. I am also looking at the fact that we are with a Circle in the World Card. Of course whatever I say may be completely wrong with location but I keep tracking David in a circle. I am looking at the fact that he was near the Bridge of Allan. If he had arrived at the University it is strange he would then decide to go North West to Bridge of Allan ? it occurred to me that he might have realised he lost his wallet and wanted to make his way back in order to retrieve this. Of course this is pure speculation or conjecture but I have been discussing this case with Dee. I note that we have dancing/music that can appear in the first sword card, David was at a Club it is a 'dark card' hence the name of the Club and night time ie. Dusk. I also note that in the last card we also have reference to 'dancing'. The World card can link to the word CLAY and there is an establishment near the Dusk Nightclub that references the CLAY word - also Corn Exchange is there and I note by the Railway it shows a bookstall and over East of that the water. The next card to the 9 of Swords is the 10 and it is water and a book. There are church references and I note there is a baptist church. The words Baker Golden and Crown can appear and they are all in the area as can the word Scholars, also in the area. It seems to me that one has to be careful in case Tarot is talking about the past and previous connection to David but it still would not harm to consider a 3 mile radius search around the Club he was last seen being escorted from. Some other indications in Tarot can show the possibility of lots of stairs or steps? did he climb up a lot of stairs or steps at some point? Of course I will come back with more information as I find it. have supplied but also what is in Tarot. Central Scotland Police later posted a message on the force's Facebook page stating: "We have carried out a detailed search on the River Forth from the Bridge of Allan area to the A91 road bridge near Springkerse in our search for missing teenager David O'Halloran. "Our intention is now to launch a larger boat on the River Forth and search from the South Queensferry area upstream to the bridge at the A91 when conditions permit. Police Report adding new search areas. It seems that Police are checking areas that are first mentioned in original Tarot and also upped the area search to 3 miles also suggested by Tarot. DONNA O'HALLORAN braved dangerous currents to search for David who has been missing since January 18. Police searching for missing student David O’Halloran are still keen to trace the white Skoda car seen in the area prior to the last sighting of the 18-year-old. Images show the car, which has been confirmed as a taxi, driving through Bridge of Allan from the direction of the university and then returning a few minutes later. The car is caught on CCTV at 2.14am as it heads through of Bridge of Allan in the direction of Keir Roundabout and is seen again 2.17am as it returns in the opposite direction back towards the university. David was seen on CCTV at 2.19am as he crosses Henderson Street. Checks have been carried out with taxi firms in Stirling. “We do not believe that the taxi was from Stirling and we are keen to hear from anybody who may have been driving a white Skoda Octavia 2004 - 2009 model with a taxi or private hire plate on the right bumper, around this time on Friday January 18 or even if somebody was dropped off in Bridge of Allan,” said Superintendent Dawson. The taxi had a small taxi sign on the roof towards the front of the vehicle and black rubbing strips along the side of the car. Anyone who may have infomration can contact Central Scotland Police on the non-emergency number 101 or 01786 456000 or information can be given anonymously to Crimestoppers on 0800 555 111. Mother's Day 'did not exist' for mum of missing student David O'Halloran - Read the Full Article. ... By Paul Reoch, 11 March 2013 2.03pm. Central Scotland Police have now traced a taxi seen heading through the town minutes earlier and are keen to speak to its passengers. Chief Inspector Russell Penman said: "The passengers of this vehicle were picked up at dusk and dropped off near to the gold club in Bridge of Allan. We are keen to speak to them as they may have seen him and provide a bit more information about him. Very sadly David has been found and it seems in woodlands above the Bridge of Allan. Im not sure where exactly but Tarot mentioned Mine Woods and Black Shed Woods. When I eventually know I will post it. David was also found in THREE months almost from when he went missing Tarot gave us that Three. The 9 probably equals the A9 Route Bridge of Allan. I really am sorry that David has not been found alive and my sincerest sympathies go to the family. I will come back to update when news breaks. Here is an informative message from Lil who often comments on the blogger with information. I've found another more up-to-date news report about where David was found and I also googled a map. Interesting that tarot picked up "tennis". I know that David had links to a tennis club in his hometown but A*** M*****'s mum recently bought a house (actually a mansion) in Upper Glen Road which is on that map and close to the location. It is not known exactly where David was found - but this area links up with Sunnylaw and Mine Woods and Black Shed Woods are within the vicinity as is a Golf Course. Airport could be references to Airthrey Road. Cornton Road to the South. The Mine Wood was formerly owned by the Westerton Estate and was purchased by Bridge of Allan Burgh Council to commemorate the coronation of Queen Elizabeth II. The network of paths which run through the wood were laid out in the mid 19th Century by Sir James Alexander of Westerton and built by local unemployed labourers. The paths were restored under a Job Creation scheme in 1982 and have recently been improved. There are many Broadleafs including Wych Elm, Oak, Beech, Birch and Sycamore - the Conifers include Larch, Scots Pine, Spruce, Douglas Fir and Western Hemlock. You can see wood pigeons, chaffinches, jays, wood-peckers, rabbits and grey squirrels. If you are lucky, you might spot roe deer. At the intersection of Sunnylaw Road and Abercromby Drive (A), you will see the signpost for COPPERMINE PATH DRUMBRAE. Climb the steps into the woods and follow the footpath as it winds its way up the hill through dense undergrowth and trees. When you come to a clearing where a wooden seat sits on the edge of the hill (B). Take the short path which goes up to the left and you will see the entrance to the mine. This long, disused coppermine was worked intermittently since the 16th Century and at one time, copper from the mine was used in the mint at Stirling Castle. The path climbs up to Pendreich Road (C). By looking back through the trees, you will get elevated views over Stirling, Bridge of Allan, the Carse and the hills beyond. 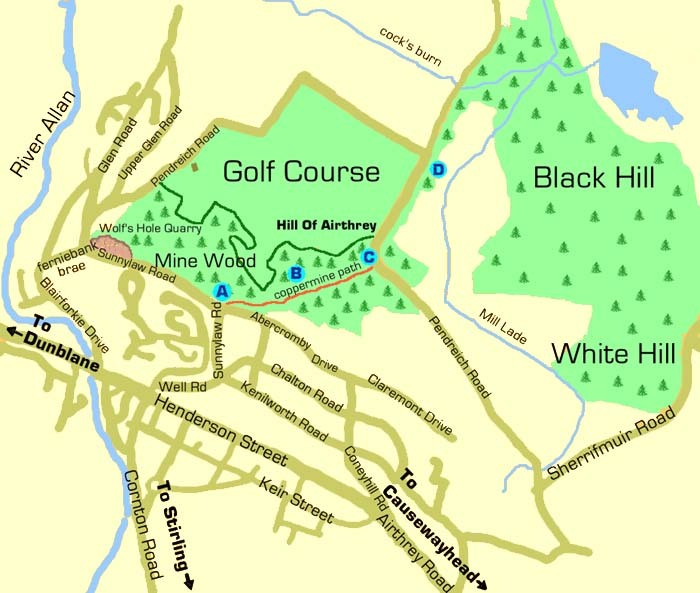 (If you want to go on further, walk along Pendreich Road past the golf course and on the right (D), you will find a footpath over the Black Hill to the Cocksburn Reservoir and Dumyat). Walk a few steps further to the back of the golf course and make your way along the path by the dry-stone dyke. From here, you will get panoramic views to the North over Dunblane. There are many paths through the woods which you can explore. The route we have chosen, is to follow the edge of the golf course all the way down. Eventually you will see the end of the woods and the rooftops of the houses on Glen Road ahead of you (E). Proceed carefully down the hill and find one of the paths which will take you into the disused and overgrown Wolf's Hole Quarry (F). Leave the quarry through the clearing, to Sunnylaw Road. Turn left and follow the terraced path back to the start of the walk. 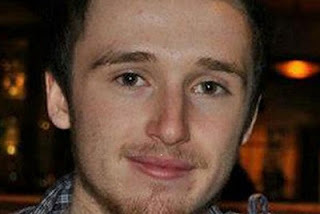 Police have confirmed a body found in woodland is that of missing student David O'Halloran. On the Facebook page, a post believed to be from Mr O'Halloran's mother Donna, from Kilmaurs, Ayrshire, said a celebration of his life will be held at nearby Stewarton sports centre on May 11 because "David loved his tennis so much". I was sent a link today as a validation for Tarot which was printed the day after David was found. Tarot seemed to track a lot of links/route connected to David and he was found in the vicinity of the suggested possibility. "It is understood the body was found in the Mine Woods in Bridge of Allan, above the university campus." "This is a firecard so words that include Burn or Fire may come up here."....Bannockburn. I have looked into this and marked off in a map areas you have suggested in tarot. Unfortunately i cannot see a clear path indication anywhere although all keywords are places in the area David went missing. Large area of water- river allan and burns, A9 ond M9 nearby, there is 3 churchs in the area, golf course, railway, hills, library. I had a feeling he fell into shallow water and hit his head. Do you feel through tarot if it was shallow or deep waters? The fact it would of been pitch black at the time maybe relates to cant see as it is a rural area. There is a FORGlen BURN which flows into the Allan river and runs along the side of Strathallan Games Park (SPORT, ARROWS - archery?). I see from Dee's map (thanks Dee) that she has marked off the Attic and a church which are both on/close to Fountain Road, which takes you down to the Games Park. Probably just grasping at straws. We will continue to believe this until told otherwise by the police. DAVID if you see or hear this , Please no that we love you son and want you to contact anyone, we all miss you and love you. Our family is incomplete without you. Giana and Kaya do not understand where you are or what has happened to you, Allanah misses the chats with you and the carry on you to have. The night David went missing he had been working before returning to his Accommodation to have a drink with friends before heading out into Stirling. He is enjoying student life. It's a rite of passage that many people before him have enjoyed. We are not pointing the finger of Blame at anybody as we do not believe that the nightclub Stewards . They did everything they would normally have done. They are not to blame for David's disappearance. David had enough money for his Taxi and he paid the driver- he was dropped off where he had asked to be dropped off. Our son is a happy, intelligent out-going boy who is driven and determined. he is hard working and we are all very proud of him. he is paying to put himself through University holding down two jobs to be self-sufficient. It's hard not knowing what has happened and its hard explaining to our other three children David's Brother and Sister's and also his Grandparents, why David has not come to see them. This is totally out of character for David to go missing. Our family consists of four children and we need them all to be complete. If you have seen David please please let the Police know- we need to know where he is. We need the Public's help. YOUR WELCOME FOR THE MAP I THINK ATTIC CREEK ROAD IS A GOOD AREA. Yes it does come up in the Tarot Dee, but its whether it in past present or future mode. Thats what I am working on right now. I'm just looking at the map of Bridge of Allan, particularly in the area where the A9 crosses the Allan Water, immediately before it there is a triangle of buildings - one of which is called the HEART of glass, another ROCK and Road. The triangle is very close to the river, so perhaps David wandered down one of the side streets towards the river. On the FB page, David's mum asked about a sluice gate on the river Forth, I see that there is a sluice gate in this vicinity of the River Allan. Again, I'm just clutching at straws. I would need to ask Dee why she thought putting that on the Map were indications gained from Tarot. I will let her answer. However, it might be someone else connected and could be why it came up? I think I mentioned this above? In current traffic: 40 mins SO ITS NOT THAT FAR AWAY.IM TRYING TO LOCATE DAVID IN ALL THE POSSIBLE AREAS. HE MAY OR MAY NOT BE IN THE BRIDGE OF ALLAN AREA JUST BECAUSE THATS WHERE HE WAS LAST SEEN.I BELIEVE DAVID GOT INTO A CAR WITH SOMEONE IT SAYS IT ALL IN THE READING.ALSO LAST I HEARD THE TAXI DRIVER SPOTTED HIM AT THE UNIVERSITY THATS WHERE I BELIEVE HE GOT INTO THE CAR WITH SOME ONE AT.HIS WALLET WAS FOUND IN THE Causewayhead Rd, AREA SO NOW THATS SHOULD SAY SOMETHING RIGHT THERE AND HE HAD HIS WALLET TO PAY FOR THE TAXI AND ALSO STOPPED AT A ATM MACHINE AND WITH DREW MONEY. "We have carried out a detailed search on the River Forth from the Bridge of Allan area to the A91 road bridge near Springkerse in our search for missing teenager David O'Halloran. Our intention is now to launch a larger boat on the River Forth and search from the South Queensferry area upstream to the bridge at the A91 when conditions permit." I thought you might be interested to see the route the police followed on the google map - Bridge of Allan to Springkerse area. Tarot: "This card can represent travel therefore connections to vehicles can show up here." THE mother of a missing student went snorkeling in a river yesterday in a desperate bid to find the body of her son. Donna O’Halloran braved cold waters and dangerous currents in the River Forth to hunt for David, 18. The Stirling University maths student, who went missing after a night out with pals, was last seen heading towards the Allan Water in Bridge of Allan more than a month ago. Donna fears David is dead and has been carried to the Forth by fast-flowing waters. The 41-year-old, who suffers from mobility problems, and her partner Malky McDougall put on drysuits yesterday and searched underwater. mother sure seems convinced that david is dead,i wonder where she is getting her info. there is always hope. David's body has been found :-(, heart breaking but at least his family can now get closure. Just been reading back on your tarot and additional notes/comments you made back in February when you suggested searching woods. 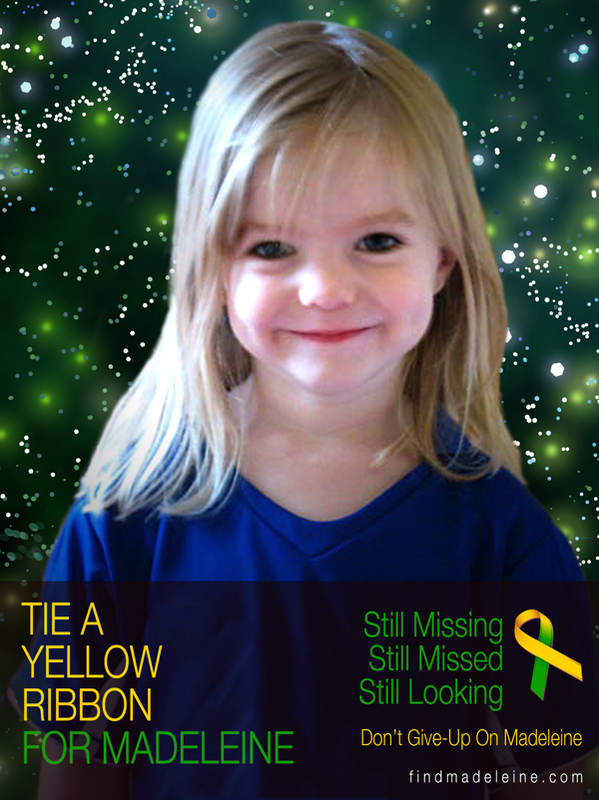 The exact location hasn't been disclosed but he was found in "woodland above Bridge of Allan". Note from Empathy: Have they searched Mine Wood or Black Shed Wood? Paula 0 Brien - psychic said David was in the water! looks like that wasnt true. Empathy you are nearer the nail as always. Did they not ask you to write for David they should have done. The request I had was from a member of the public. I cant comment on anything else. I only write what I see from Tarot's prospective. If another psychic is wrong they have to deal with that and not me. Verification of tarot - "We have note that...possibly drugs or some impairment of mind for someone."